Why would you choose a piece of fresh fruit for a snack over a bag of pretzels? What is the healthier choice? 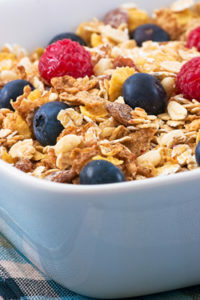 The 2010 Dietary Guidelines for Americans recommends that Americans focus on maintaining calorie balance over time to achieve and sustain a healthy weight and focus on consuming nutrient-dense foods and beverages. These recommendations, along with physical activity, can help people reduce their risk of chronic disease and promote overall health. When eating a healthy diet, brightly colored fruits and vegetables are the big winners in nutrient density. That’s one reason why so many fruits and vegetables qualify as superfoods, or foods that are rich in nutrients and other compounds that have healthy benefits such as fiber, phytochemicals and essential fatty acids. Some superfood examples include: carrots, watercress, tomatoes, broccoli, kale, spinach, collards, bok choy, spinach, berries, apples, cherries, pomegranate and oranges. Other nutrient-dense superfoods include salmon, tuna, trout, low-fat dairy products, oatmeal and whole grains, soy, dry beans sand even some fortified foods. Again nutrient dense poor foods include things that are high in sugar and fat such as refined white breads, pasta, pastries, processed lunch meats and cheeses, ice cream, candy, soda, potato chips and corn chips. In other words, junk food. Choosing nutrient-dense foods at the grocery store can be easy if you stay along the edges of the store, where the produce, fresh lean meats, low-fat dairy and fresh bakery goods are found. If you choose some packaged foods for convenience, be sure to read the food labels for smart choices. You can easily find the Nutrition Facts labels on the backs or sides of the packages. Look at the serving sizes, note the number of calories per serving and look at the amount of fiber, vitamins, calcium and iron. The packaged food that has the better combination of lower calories, higher nutrients and less sodium is the best choice. You can make any meal nutrient-dense by including one serving of a healthy protein source such as legumes, fish, poultry or lean meat (one serving of protein is typically about the size of a pack of playing cards). The rest of the meal should be made up of healthy side dishes. Vegetables are always great, even with a little bit of cheese or sauce. Choose wheat pasta instead of regular pasta, and brown rice instead of white rice. Add a green salad with lots of vegetables as side dish or serve a big salad as a meal. Vegetable soups made with clear broth are nutrient-dense and have fewer calories than a comparable rich creamy soup. Eating nutrient-dense foods will ensure you are getting the right nutrients, will make you full and won’t leave you feeling hungry later. Choosing nutrient dense foods can become a habit in your daily eating routine. Now that you understand which foods are more nutrient dense, the rest is easy. Just remember that the foods you eat can affect your health in a very big way. The choice is yours. Choose healthy!